Biforme, quod non est homo, nec est draco? Vir anguipes dici, & homiceps anguis potest. Nec finis hominis est, initium nec est ferae. Sic & gigantes terra mater protulit. Terrena tantùm quique curet, indicat. What shall I say? By what name call this two-fold monster, that is neither man nor snake? 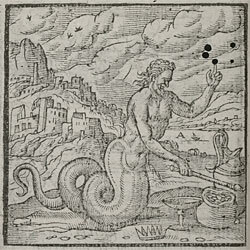 A man without feet, a snake without its upper parts - this can be called a snake-footed man, a man-headed snake. The man farts a snake, the snake has vomited a man, the man has no end, the beast no beginning. In such a form did Cecrops once rule in learned Athens, in such a form did Mother Earth once bring forth the Giants. This is an image of clever men, but indicates one without religion, who cares only for the things of the earth. 1. This epigram is based on Anthologia Graeca, 16.115-6, descriptions of a hippocentaur, the second of which was translated by Alciato at Sel. Ep. p.335. Metre: dactylic hexameters paired with iambic senarii. 2. Variant reading, ‘monstrum? Biforme quod...’, ‘monster? A two-fold thing, that is neither ...’. 3. Cecrops, the mythical wise first king of Athens, the city of Pallas Athene, the goddess of wisdom. 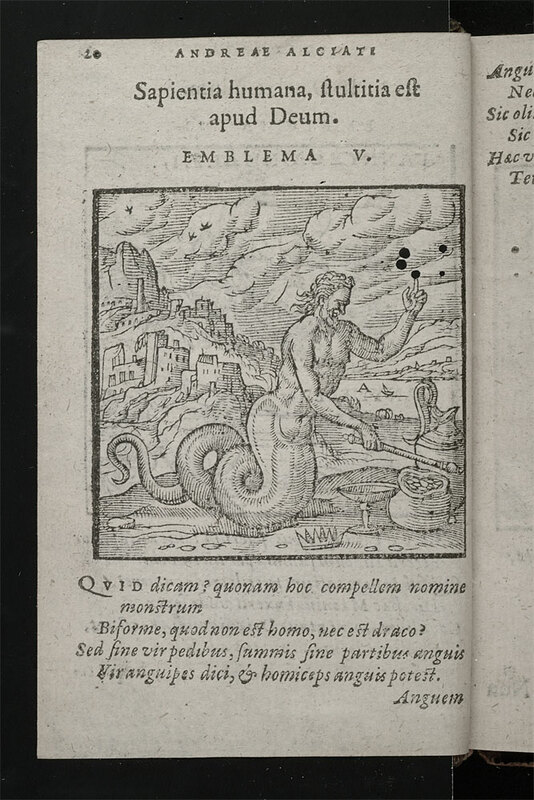 Cecrops, like the Giants (l.8) was born of the earth and was represented as half-man, half snake. 4. Terrena tantum quique curet, ‘who cares only for the things of earth’. See Macrobius, Saturnalia, 1.20.9: the fact that the Giants’ bodies terminated as snakes shows that they had not a single thought that was right or elevated, but that their life in all its comings and goings tended to what was base.